What are some signs that I may need braces? Do I need to be in a certain age range for braces? What should I expect at the consultation appointment? Can I get braces on the same day as my consultation appointment? The American Association of Orthodontists recommends that a child be evaluated by age seven (at the time permanent teeth begin to appear) in order to detect any potential problems. Early detection and treatment can help prevent extraction of teeth or larger problems later. As for adults, as long as the gums and bone that support your teeth are healthy, orthodontic treatment can begin at any age. There are plenty of technological advancements that make today’s orthodontic treatment more comfortable. Initially, braces can cause some discomfort until you get used to them. The mouth can also be a little sore a day or two after every adjustment appointment. If the discomfort is too much, it can be relieved easily with over-the-counter pain relievers. Treatment times and success rates depend on many factors including age of the patient, the severity of the problem, the patient’s cooperation, and the speed of the teeth’s natural response which can vary depending on the individual. Braces are typically worn for 18-36 months, with an adjustment appointment every 4-8 weeks. Our offices offer many different types of braces: stainless steel or silver braces, gold braces, clear or ceramic braces, and Invisalign®. Each option or type of braces available can be discussed during your free exam and consultation. Silver Braces: Stainless steel braces or silver braces tend to be the most popular and traditional form of braces people know about. They are much smaller and more comfortable than they used to be. These braces allow you to be creative with the color of the ties you choose at each adjustment appointment. 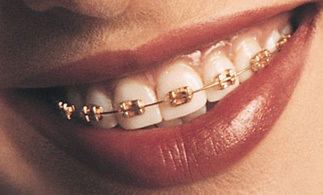 Gold Braces: Gold braces are another form of metal braces that are 24 carat gold plated. They have the same function as silver braces with a different appearance. Some people feel gold braces tend to have a softer and warm look compared to the silver braces and feel this will blend better with their smile. Others like the unique or “jewelry” look and luster of the gold braces and want them to stand out. Ceramic braces: Clear braces or ceramic braces are also becoming more popular among adult and teen patients since they are less visible than metal braces. They do have some limitations since they require more upkeep than metal braces. 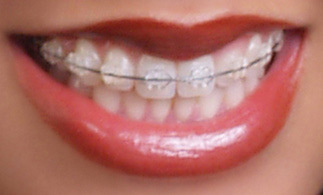 People who are allergic to metal can get ceramic braces since they are made of a high-tech glass-like material. Invisalign®: Invisalign® is a type of “invisible braces” and is available in most of our locations. 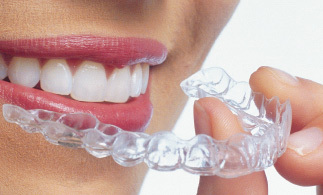 Invisalign® is a type of braces that uses a series of thin, clear plastic aligners. These aligners are removable for when you are eating or cleaning your teeth. The Invisalign® System is becoming a very popular method of orthodontic treatment for adults. They consist of a series of clear orthodontic appliances called aligners that allow you to straighten your teeth without having to wear traditional braces. Each set of custom-made aligners is worn for about two weeks and moves the teeth in small steps to the desired final position. However, not all orthodontic patients are candidates for this treatment option. For more information about Invisalign® or to evaluate whether or not you are a good candidate, please schedule your free exam and consultation. How much will braces or Invisalign® cost? The cost of your Invisalign® system is based upon the individualized treatment plan that you develop during your consultation appointment. The staff and orthodontists of Orthodontic Specialists of Florida don’t want the cost of Invisalign® to keep you from having a healthy, beautiful smile. Speak with us about our financing options, including CareCredit®. If you would like to be approved for CareCredit® or other financing before your consultation appointment, contact our office and we will provide you with more information about how to apply. We will work with you to come up with a payment plan that can fit your family’s budget. In many cases, your monthly payment can be less than $100. Your initial visit to one of our offices will give you an opportunity to meet the doctor and our knowledgeable staff. They will answer any questions you may have. This appointment is complimentary, and you will receive a clinical examination to determine whether orthodontic treatment is right for you. After a course of treatment and treatment duration are decided on by the orthodontist, our staff will provide you with estimated costs and payment options. Should you decide to begin treatment with our office, our clinical staff will take the records and make a convenient appointment for your fitting. Yes! In most cases, you can get your braces on in the same visit as your consultation if your dental work is current.